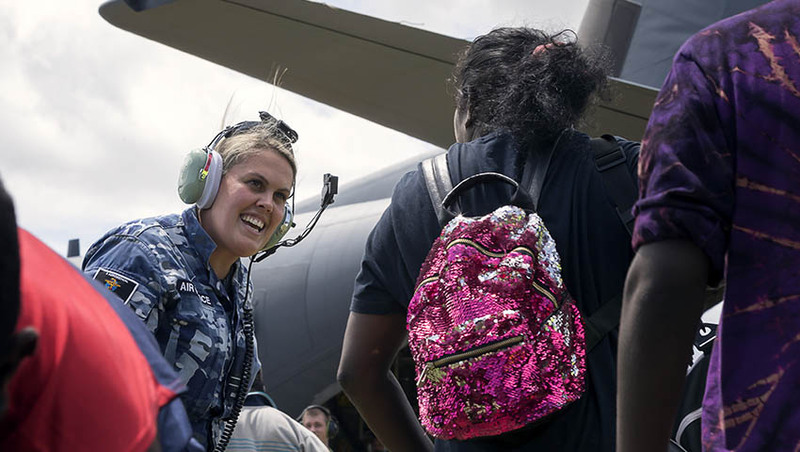 The Australian Defence Force is assisting the evacuation of remote communities in the path of Tropical Cyclone Trevor, alongside the Northern Territory government. A Joint Task Force consisting of around 200 Defence personnel has been established from the Australian Army's 1st Brigade in Darwin, to help co-ordinate the ADF's response in supporting the evacuations. The NT government requested support from Defence on Wednesday, 20 March through Emergency Management Australia, with "close co-ordination" continuing between the agencies. Three Royal Australian Air Force C-130J Hercules transport aircraft have evacuated residents in East Arnhem Land, including Groote Eylandt and McArthur River Mine Airport near Borroloola. These areas are in the cyclone path. A fourth aircraft, a C-17A Globemaster, is currently on standby to support from RAAF Base Tindal if necessary. The aircraft are expected to conduct a number of 'sorties' each throughout the day to evacuate community members identified by the NT government for emergency evacuation. Residents have been urged to seek advice from local authorities in regards to evacuation procedures and locations. The ADF added that it maintains "a range of short notice domestic disaster relief response options and [stand] ready to support further requests for assistance from the Northern Territory government". Inquiries on the evacuation operation should be directed to the NT government.